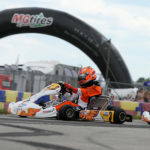 The season finale for the United States Pro Kart Series put the first half of the weekend to bed with Round Five contested at the New Castle Motorsports Park. The Hoosier Grand Prix is welcoming 160 entries over seven categories on the weekend, working through the long day of Saturday featuring qualifying, two heat races and the main event. Weather was perfect all day, and the racing was close in nearly all the categories. The championship chases were more defined, heading into Championship Sunday. 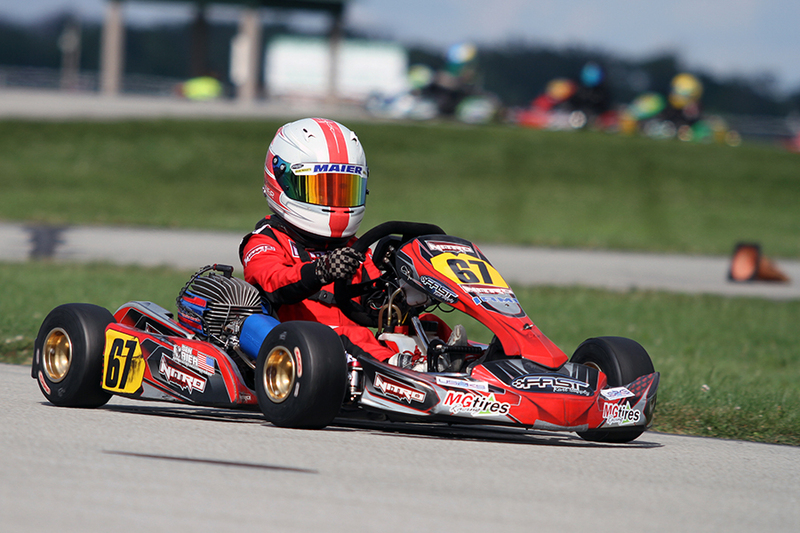 Brandon Jarsocrak came into the weekend as the IAME Pro championship leader and defending champ. It was a perfect score on the day to extend his lead heading into the finale on Sunday, with a sweep of Round Five. Jarsocrak (KSNA / Kart Republic) set fast time in qualifying and won both heat races to remain at the point for the Final. Ocala winner Austin Garrison (Fullerton) and 2017 rival Alex Bertagnoli (FMS / Kart Republic) joined Jarsocrak at the front for the 18-lap Final. Each took a turn at the point in what was a clean, but calculated race between the trio. Jarsocrak was leading at the white flag with Bertagnoli on his tail. Running the fastest lap of the race, Bertagnoli tried a last lap effort but came up 31 thousandths of a second short at the line with Jarsocrak earning his third straight series victory. Garrison was a close third, losing valuable points to Jarsocrak in the championship chase. Stephen Dial (CompKart) bounced back from a DNF in Heat #2, coming from 17th on the grid to finish a solid fourth, matching the pace of the leaders. Colin Neal (MDD / Kosmic) won the fight for fifth. The day looked to belong to Colton Ramsey in the KA100 Senior division. Qualifying third, Ramsey (Innovative / Exprit) took both heat race wins to secure the pole position for the main event. Championship leader Zach Hollingshead (OGP / Tony Kart) fought his way forward in Heat #1 after qualifying 15th, ending up second and holding the spot in Heat #2 for a front row main event start. Ramsey set the pace for the first 11 laps of the Final until Hollingshead took over the point. Mike McAndrews (Fullerton) followed him through, and the two fought for the lead in the closing laps. Hollingshead was able to secure the lead in the final corners, holding on at the line by 13 thousandths of a second for his third victory of the season, extending his point lead. McAndrews settled for second with Ramsey in third. TJ Koyen (Innovative / Exprit) was right there all day, bouncing back from an off-track excursion early in the Final to end up fourth ahead of Throwdown king Josh Hotz (FMS / Merlin). 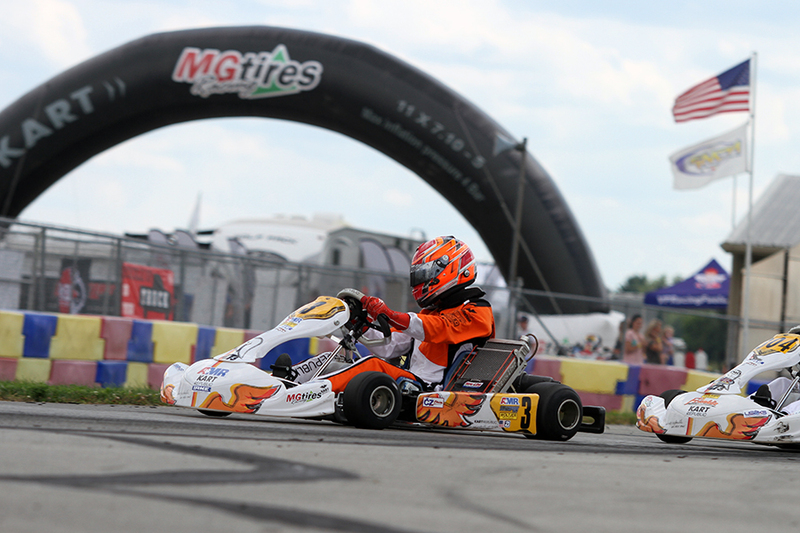 Jeremy Fairbairn was able to leave GoPro with two victories in the IAME Junior category. The Florida driver came back to New Castle to control the action on the day for a third straight series victory. Fairbairn (MDD / Kosmic) was only fourth after qualifying with championship leader Nicholas Terlecki (FMS / Merlin) setting fast time. Fairbairn left both heat races with the win, putting him on the pole position for the Final. At the helm, Fairbairn was tough to get around, including defensive lines in the last few circuits. 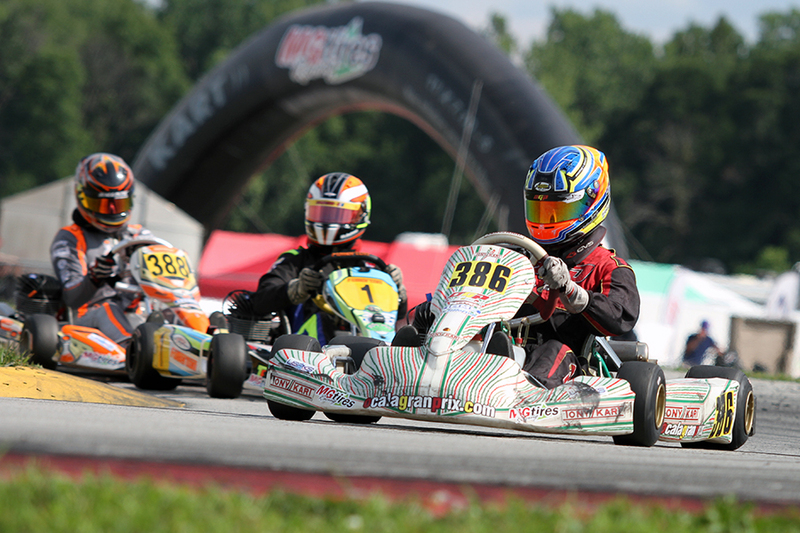 Shuffling on the final lap gave him enough of a gap to cruise to the checkered flag for the victory, his fifth straight counting USPKS and WKA competition. Canadian Justin Arseneau (SCR / Tony Kart) recorded fast lap of the race in his runner-up effort, with Luca Mars (SCR / Tony Kart) rounding out the podium as Tyler Maxson (CRG) came one spot short. A great run for Texan Luke Lange (SCR / Tony Kart) to fifth put Terlecki in the sixth spot, making tomorrow’s run for the championship still up for grabs. 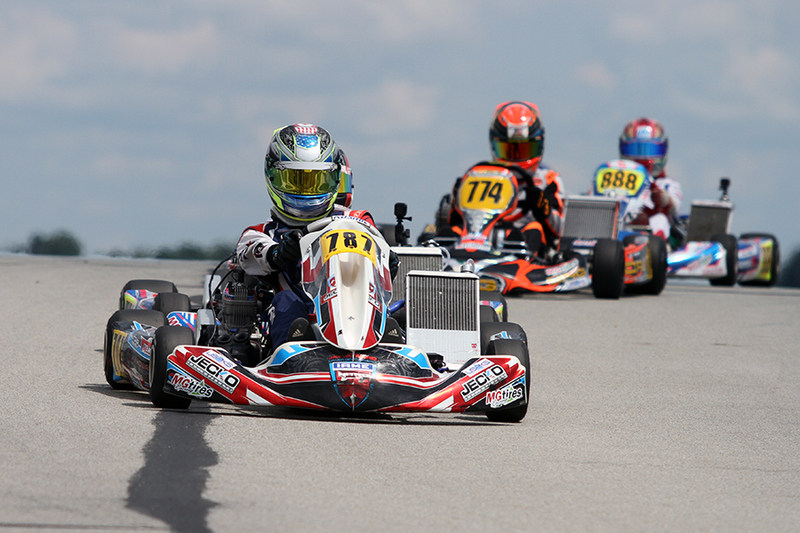 The field in the KA100 Junior class was tight, with a handful of driver in the mix. Garrett Adams (Comet / FA Kart) used home track knowledge to his advantage by edging out the competition in qualifying and in both heat races. The Final was not a calculated. Adams was shuffled back early with Donald Whorton II (VSR / Tony Kart) and championship leader Jacob Graham (Nitro / Exprit) at the point. Contact between Whorton and Hayden Jones (Kosmic) took them out of the running as the lead pack continued shuffling during the second half of the race. Graham was run down by Adams and Spencer Lofton (Tony Kart). Lofton was able to hold on at the checkered to cross the line first. A two-position bumper penalty however took the win away, handing it to Graham. Adams would have finished second, but a two position penalty for avoidable contact moved him down to fifth. This put Erikson Evans (Kosmic) up to second, Lofton third on the podium and Grayson Upchurch (Praga) into fourth. Scott Roberts helped his bid for a run at the IAME Masters championship with a sweep of Round Five. Roberts (SCR / Tony Kart) was able to lead the day in the category, but not without a challenge. Class newcomer Darin Marcus (Fullerton) and SummerNationals winner Laurentiu Mardan (Tecno) kept Roberts honest through the two heat races, and turned up the wick in the Final. Mardan took over as lead challenger in the Final, with Marcus slipping back and eventually retiring with mechanical issues. Mardan led for three laps, with Roberts leading the majority of the race. Mardan would get shuffled back by Tecno teammate Andriy Tsyupka while Scott Kopp (Innovative / Exprit) followed him throught. Tsyupka went after Roberts prior to the white flag, and contact was made. The two drove wide, allowing Kopp to slide through for the lead. He held the spot until the I-70 corner, where Roberts took over the lead and held to it by 57 thousandths at the checkered flag. Mardan came back to take third from Tsyupka with John Robicheaux (Kosmic) up to fifth after Cristian Vomir (Tecno) suffered a two position penalty for his bumper. There was no clear-cut star on the day in the Mini Swift division. Noah Baker (Kart Republic) set fast time in qualifying while Christian Miles (Kart Republic) and Brent Crews (Nitro Kart) won the heat races. Everyone had some sort of trouble, allowing Sofia D’Arrigo (Nitro Kart) to earn the pole position in the Final with two third place finishes in the heat races. The lead group was nearly the entire field during the Final. Crews was among the different leaders along with Elliot Cox (Vemme) and Sebastian Ng (Nitro Kart). Crews and Ng put themselves together in the closing laps, and held off the rest of the field to decide the race themselves. At the line, Crews took his second victory of the season by 32 thousandths ahead of Ng. Miles bounced back from a bad Heat #2 to earn the final step on the podium ahead of Cox with point leader Kai Sorensen (Tony Kart) in fifth. Ben Maier locked up the provisional championship in the Micro Swift category with a sweep of Round Five. Maier (Nitro Kart) capped off a solid day of driving with a four-second advantage in the 14-lap Final. Hoyt Mohr (Nitro Kart) won the fight for second ahead of Spencer Conrad (Nitro Kart). Santiago Duran (Nitro Kart) was fourth, but a bumper penalty dropped him two positions while a two-position penalty for blocking dropped Aryton Grim out of the top-five. Those sentences moved Cameron Brinkman (Merlin) – who had fast lap of the race – into fourth with Cameron Weinberg (Nitro) into fifth.